You have deadlines to meet, projects behind schedule, and a team of stressed, unhappy and unproductive colleagues. Your workers are rubbing their necks from hunching over projects and complaining of headaches and strained eyes from logging those late night hours. Now imagine what will happen to morale the moment you tell everyone the good news. You’ve scheduled a certified massage therapist to spend 30 minutes easing their sore muscles and soothing away those stress headaches. What do you think that can do for productivity? Chair Massage will breathe new life into your daily routine and make any event unique and memorable. Infinite Massage is the leading national Corporate Wellness Company specializing in Onsite Corporate Chair Massage Programs, Event Massage Services and more. We can bring something to the table that no other company can. Our convenient on-line scheduling allows your employees to schedule a chair massage that works for their busy schedule. Everybody wins with Chair Massage. 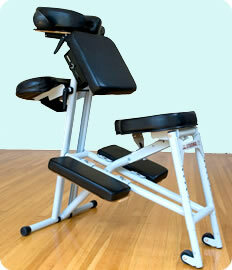 We come to you as the Mobile Massage Therapists have professional massage equipment that is completely portable. They will arrive early to set up their supplies and equipment, you simply need to provide a space for them to set up shop. Break rooms, conference rooms, empty cubicles – anywhere where you can send your employee for a few mninutes of relaxing Chair Massage Therapy, will be perfect. It’s fast and easy for employees to reserve their chair massage appointments – they can access your company’s secure signup schedule from any web browser. On-Site administrators also have the tools to manage the entire program from their web browser.